In a Seltzer & Company poll released over the weekend – the first poll of Democrat Iowa Caucus goers for the 2020 cycle, Hickenlooper came in at 1% of respondents citing him as their first choice for president. An additional 1% listed them as their second choice. The governor’s net favorable rating came in at 24%, with a net unfavorable of 9%. 67% of respondents answered “not sure” on the favorability question. Out of the 21 Democrat candidates who were presented in the survey, just five contenders came in with a higher “not sure” total, including a businessman named Andrew Yang, the governor of Montana, and the governor of Washington. 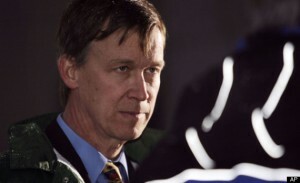 Looks like Hickenlooper and his strategy team have their work cut out for them. Dominating the survey of 455 likely caucus-goers was former VP Joe Biden, at 32%, and Socialist Democrat Bernie Sanders at 19%. We’re sure how long Hickenlooper wants to pour time and resources into this mission, which seems little more than a vanity campaign at this point.